Another new artist on the Blog, Jim Ottaway has a long track record. A renowned musician in Australia who has been touching all styles since he made First Light in 2004, Jim Ottaway has accumulated nominations for the Australia Music Awards with no less than 17 nominations since 2010. “Timeless e-Motion” is already a 22nd album for the one who won the prize of the best ambient music in 2016 with the album Southern Cross. But this “Timeless e-Motion” is not an ambient album, apart from a few titles, for the one whose influences vary between Tangerine Dream, it's heard on this album, and Code Indigo, it's also heard, while going through opposites as big as Vangelis and Radio Massacre International. Built on 13 tracks all very well composed, “Timeless e-Motion” is offered in CD manufactured with a top-nickel production and in downloadable option. It's a big 65 minutes of music which is drinking at all the streams of EM. A rise of cosmic effects awakens "Sequence of Life". Between crispy tones and more usual ones, the sequences flutter in an undulating mass and the percussions stage a rhythm in opposition with a more rock approach. The ambiences are adorned of electronic chirpings and of clapping percussions effects that will be used extensively on this album. The harmonious approach is built on loops of harmonies with bipolar hues. The structure makes me think a lot of David Wright. The title-track shows that Jim Ottaway is very comfortable in a good Berlin School vibe, kind of Software, with undulating and hypnotic loops which are rolling in a minimalist vision. The structure is more in the cosmic genre with echo effects in these loops that end up weaving a fairly esoteric undulating rhythm where these clapping percussions get grafted. The synth throws semi-strident vocal fragments as well as these cosmic mists that fill a lunar decor loaded by multiple effects, both vocals and cosmic. I like "Skies Rain Down"! Its rhythm is unraveling with a sovereign slowness propelled by slamming percussions and whose resonances cling to a breakthrough of percussions that don't succeed to take off an exhilarating rhythmic pattern. The synth pads put down effects of fogs and voices while a guitar, and its morphic solos, adds a hopping rock zest inspired by Code Indigo. A little more muscular, with a throbbing and undulating pace rhythm and rattlings of percussions, "Reality's Edge" exploits the guitar a little bit more with good harmonic jets, which flirt in loops, and pieces of poignant solos on a rhythm dominated by the multiple slamming of percussions. The final will tackle you down! "Blurred Vision" offers a dynamic rhythm driven by two lines of sequences, including a more harmonic, and a line of bass pulsations. The synth throws effects that sing like reflections on the water, while the rhythm gains in force with the addition of percussion. "Game Over" brings us to a more Dance Music approach with good Berlin School elements. We are not far from the good music of Stefan Erbe! Like several other titles on “Timeless e-Motion”, it's with amazement that we follow the evolution of "Behind Closed Eyes". Its introduction is agitated by a pond of sequences fluttering with vigor. A layer of voice covers this stationary excitement. A line of sequences throbs while staying in an immobile embryo before it takes off in a more exciting structure where is added an astonishing rhyme that flirts between Mike Oldfield, Enigma and Edgar Froese. We enter the New Age phase of this album with titles like "Desperate Measures" which proposes a structure evolving in the same vision but in a harmonious cocoon much more New Age. Some good New Age with a clear influence of Edgar Froese. "Towards the Unknown" is another good electronic rock adorned of floating cosmic effects, an Elven voice and an increasingly New Age envelope. A title with an aboriginal dance approach simply attractive in its more experimental envelope, "Nothing Ventured, Nothing Gained" offers a good down-tempo full of sequences and percussions in dance mode. The sequences are genius with their different colors, including a succulent organic and another with Didgeridoo tones, which structure a rhythmic broth from which evaporate beautiful things from a synth as creative as the sequencer. Harmonious synth lines, strobe effects, mists of cosmic fog and good synth effects in search of a harmony line. In short, the creative pool of "Nothing Ventured, Nothing Gained" is of an incredible sound depth. "Evolutionary Phase" evolves towards a good electronic rock with a hue of organic dialogue in some sequences. Speaking of sequences, they are as seductive as they are very versatile. A bit like in some good Chris Franke's ideas. 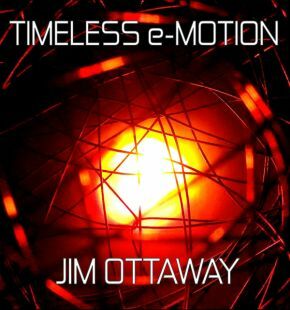 "Cosmic Shift" comes to the conclusion of this surprising, it's the case to say it, album of Jim Ottaway with a more floating, a more cosmic approach, whereas "Timeless e-Motion (Radio Edit)" ends the 65 minutes of this album with a version edited for radios of the title-track. Although disconcerted by the New Age segment of “Timeless e-Motion”, this first ID card from Jim Ottaway offers a good diversity that should seduce you without difficulty. You can find everything here. And everything is done with a professionalism that matches David Wright's albums. There is a little something indefinable that stems from the Australian musician's vision, making his music even more seductive. Is it the Down-Under effect? Possible! But no matter, we are dealing with a musician and a composer whose talent is heard throughout “Timeless e-Motion”. Even in its more New Age segment. Un autre nouvel artiste sur le Blog, Jim Ottaway a pourtant une longue feuille de route. Musicien renommé en Australie qui touche à tous les styles depuis qu'il a lancé First Light en 2004, Jim Ottaway accumule les mises en nominations au Music Awards d'Australie avec pas moins de 17 nominations depuis 2010. “Timeless e-Motion” est déjà un 22ième album pour celui qui a gagné le prix de la meilleure musique ambiante en 2016 avec l'album Southern Cross. Mais ce “Timeless e-Motion” n'a rien d'un album d'ambiances, mise à part quelques titres, pour celui dont les influences varient entre du Tangerine Dream, ça s'entend sur cet album, et du Code Indigo, ça s'entend aussi, en passant par des opposés aussi grands que Vangelis et Radio Massacre International. Serti sur 13 titres tous très bien composés, “Timeless e-Motion” est offert en CD manufacturé avec une production top-nickel ainsi qu'en format téléchargeable. C'est du gros 65 minutes d'une musique qui s'abreuve à tous les ruisseaux de la MÉ. Une montée d'effets cosmiques éveillent "Sequence of Life". Entre des tonalités croustillantes et d'autres plus usuelles, des séquences papillonnent en masse ondulante et des percussions tracent un rythme en opposition avec une approche plus rock. Les ambiances sont ornées de pépiements électroniques où s'ajoutent des effets de percussions claquantes qui seront utilisées abondamment sur cet album. L'approche harmonieuse est construite sur des boucles d'harmonies aux teintes bipolaires. La structure me fait penser beaucoup à David Wright. La pièce-titre démontre que Jim Ottaway est très à l'aise dans du bon Berlin School, genre Software, avec des boucles ondulantes et hypnotiques qui roulent dans une vision minimaliste. La structure est plus dans le genre cosmique avec des effets d’écho dans ces boucles qui finissent par tisser un rythme ondulatoire assez ésotérique où se greffent ces percussions claquantes. Le synthé lance des bribes vocales semi acuités ainsi que ces brumes cosmiques qui remplissent un décor lunaire rempli par de multiples effets, tant de voix que cosmiques. J'aime bien "Skies Rain Down"! Son rythme se dénoue avec une lenteur souveraine propulsée par des percussions claquantes et dont les résonnances s'accrochent à des percées de percussions qui n'arrivent pas à faire décoller une rythmique savoureusement enivrante. Les nappes de synthé étendent brume et voix tandis qu'une guitare, et ses solos morphiques, ajoute un zest de rock planant inspiré de Code Indigo. Un peu plus musclé, sur un rythme pulsatoire ondulant et des cliquetis de percussions, "Reality's Edge" exploite un peu plus la guitare avec de bons jets harmoniques, qui flirtent en boucles, et des bribes de solos poignants sur un rythme dominé par des cliquetis de percussions. La finale va vous plaquer au sol! "Blurred Vision" offre du rythme entraînant poussé par deux lignes de séquences, dont une plus harmonique, et une ligne de basses pulsations. Le synthé fait miroiter des effets qui chantent comme des reflets sur l'eau alors que le rythme gagne en vigueur avec l'ajout des percussions. "Game Over" nous amène vers une approche plus dans le genre Dance Music avec de bons éléments de Berlin School. Nous ne sommes pas loin d'un bon Stefan Erbe. Comme avec plusieurs autres titres dans “Timeless e-Motion”, c'est avec étonnement que l'on suit l'évolution de "Behind Closed Eyes". Son introduction est agitée par un bassin de séquences papillonnant avec vigueur. Une nappe de voix recouvre cette excitation stationnaire. Une ligne de séquences vrombit tout en étant dans un embryon immobile avant qu'elle ne décolle dans une structure plus enlevante où se greffe une étonnante comptine électronique qui flirte entre du Mike Oldfield, du Enigma et du Edgar Froese. Nous entrons dans la phase plus New Age de cet album avec des titres comme "Desperate Measures" qui propose une structure évoluant dans la même vision, mais dans un cocon harmonieux nettement plus New Age. Du bon New Age avec une nette influence d'Edgar Froese. "Towards the Unknown" est un autre bon rock électronique orné par des effets planants, une voix d'Elfe et une enveloppe de plus en plus New Age. Un titre avec une approche de danse aborigène tout simplement attrayante dans son enveloppe plus expérimentale, "Nothing Ventured, Nothing Gained" propose un bon down-tempo bourri de séquences et de percussions en mode danse. Les séquences sont ingénieuses avec leurs différentes teintes, dont une succulent organique et une autre aux tons de Didgeridoo, qui structurent un bouillon rythmique d'où s’évaporent de belles choses d'un synthé aussi créatif que le séquenceur. Des lignes de synthé harmonieuses, des effets stroboscopiques, des brumes nattées de brouillard cosmique et des bons effets de synthé à la recherche d’une ligne d'harmonie. Bref, le bassin créatif de "Nothing Ventured, Nothing Gained" est d'une profondeur sonore tout simplement incroyable. Le son est incroyable! "Evolutionary Phase" évolue vers du bon rock électronique avec une teinte de dialogue organique dans certaines séquences. Parlant des séquences, elles sont aussi séduisantes que très versatiles. Un peu comme dans du bon Chris Franke. "Cosmic Shift" arrive à la conclusion de ce surprenant, c'est le cas de le dire, album de Jim Ottaway avec une vision plus planante, plus cosmique, alors que "Timeless e-Motion (Radio Edit)" achève les 65 minutes de cet album avec une version faite pour la radio de la pièce-titre. Quoique déconcerté par le segment New Age de “Timeless e-Motion”, cette première carte de visite de Jim Ottaway offre une belle diversité qui devrait vous séduire sans difficulté. On y trouve de tout. Et tout est fait avec un professionnalisme qui égale les albums de David Wright. Il y a un petit quelque chose d'indéfinissable qui émane de la vision du musicien Australien, rendant sa musique encore plus séduisante. Est-ce l'effet Down-Under? Possible! Mais peu importe, nous avons affaire à un musicien et un compositeur dont le talent s'entend tout au long de “Timeless e-Motion”. Même dans son segment plus New Age.